Join our fright of poet ghost readers & enjoy some BYOSpirits on Halloween Eve for the first installment of the Bombay Gin Reading Series. Expect pandomonium & feelings. It is a costume party. You can dress up as anything you want, especially if it’s a sheet ghost. That would be cool, a bunch of people all dressed up like sheet ghosts but w/e! Think about it. Either way. Oh she’s a scary little fairy person poet broh! She has a spooky name. No one knows what color her hair will be. She got the good words though broh! Poetess & painter & witch. Her poems are spells and her spells are potent. Beware the enchantment broh! Naropa University and The Jack Kerouac School of Disembodied Poetics will host another WHAT WHERE Reading Series featuring writers Harmony Holiday, Danielle Pafunda, and Carolina Ebeid. When: October 27th, 2015 from 7:30-9:00 pm. Where: The Performing Arts Center at Naropa University’s Arapahoe Campus, 2130 Arapahoe Ave, Boulder, CO.
Come join! Reception and refreshments to follow. BOMBAY GIN ISSUE 42 IS IN THE MAKING! Our 42nd Issue, Reprogramming the Wilderness, is in the making! A big thank you to all of our readers and to all of those who submitted their prose, poetry, book reviews, and art pieces. We so look forward to putting this issue together for everyone to enjoy. 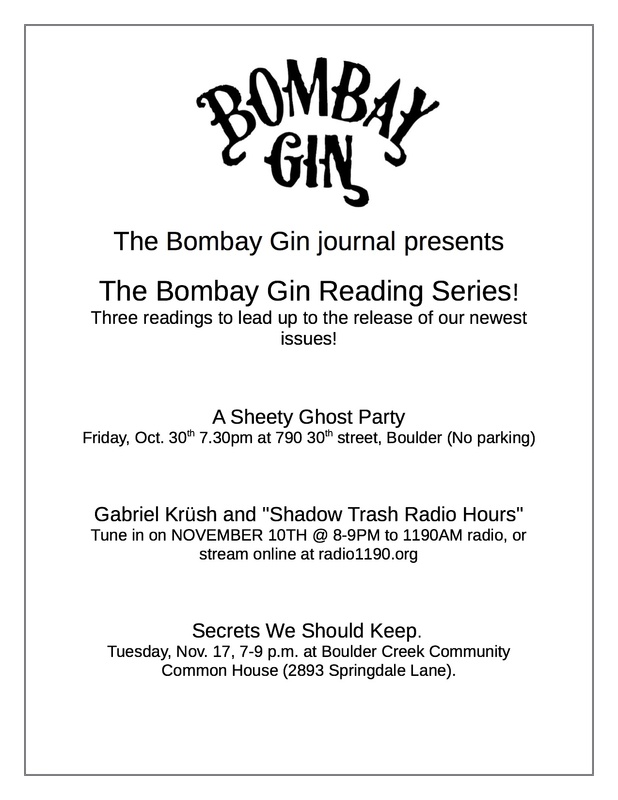 More information on Bombay Gin sponsored readings, fundraising events, and release party details will be posted in the weeks and months to come.